Get me talking about shoes and you’ll have me talking all day. I admit it, I am a shoe lover from way back – before-I-could-walk way back. I’m proud as punch to say my daughter has inherited this trait and her vast shoe collection is almost embarrassing. But how can I stop when supremely beautiful shoes keep knocking on my door? Like these stunners from Nordic shoe company Swedish Hasbeens. 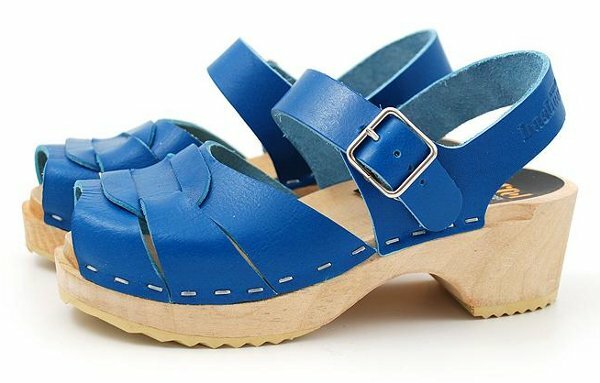 First setting my eyes on these delicious children’s clogs catapulted the peep toe sandals into my top ten shoe moments. The straight-out-of-the-70s design and delectable colours will have little girls in a shoe frenzy. The features are plentiful: they’re handmade in Sweden with respect for the environment; easy to wear; gentle on growing feet with the supple foot-forming leather; easy to clean; and best of all kids will love wearing them simply for the sound the wooden soles make. I know my daughter would adore these sandals but she’s still a little young. However, they are etched in my memory and I’m sure she’ll have a pair (or two!) in coming years. To snap up a pair for your girl, head straight to the Swedish Hasbeens website. They’re available in euro sizes 28-34 and are US$116, which includes shipping to Australia.